The reason I brewed Mais Epice has a story behind it that I documented already. An official tasting has come after multiple tastes of the beer (typical of my write ups). If it wasn’t for my methodical ways, this beer probably would have received poor reviews, if I was in a good mood. The first time I tasted the beer was only a week after bottling. Star anise. Star anise. Star anise. Yes, that’s what the beer became. The aroma and the flavor was dominated by star anise. I only used one whole star anise in the batch but it had kick. I dismissed that first tasting, thinking to myself that hopefully time will allow for the anise to drop out. Fast forward almost two months. I tried the beer about a week ago, noticing how the anise had mellowed and the beer rounded out, balanced. I was much happier with the beer and it was time to share with friends. Look: The beer has a pour perfectly clear,with a nice orange/gold color. The foam is a half-inch thick. The retention is about normal for a saison while there is barely any lacing. Aroma: Saison phenols are nicely supported by the spice. Star anise, black pepper, slight bitter and clean, sweet orange layer. 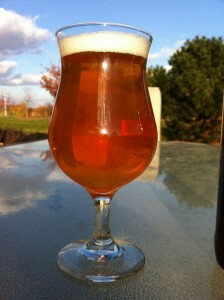 Taste: Similar to the aroma, the base Saison comes through with a supporting cast that adds complexity. Star anise, pepper and bitterness all come in mid-to-late, lingering gently but not overwhelming. Drinkability: Medium body. Medium carbonation at best. Tiny bubbles fill the mouth to aid in the body. Maybe not enough but the combination is fine for the beer. Overall: A month has mellowed the star anise, creating a much more balanced and therefore complex beer. I can have one or two of these a week before it becomes to much for me. I will be this again but not something that will ever make my “normal” rotation. Thanksgiving time might be the best time for this beer; brewing it 10 weeks or more before the date. Enjoy! Useless Fact: Drinking a banana milkshake is a perfect cure for a hangover. 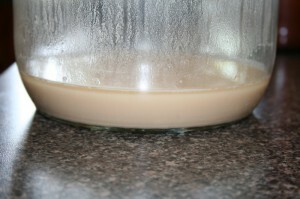 White labs 566 yeast starter warming for pitching. On our family trip this year I scored a bottle of Saison De Pipaix a great saison from Brasserie à Vapeur. I had been mesmerized by this beer from the first time I read an article in BYO on the brewery using steam power and only brewing occasionally. It seemed interesting. The recipe was in the magazine article but I always wanted to try the beer before I brewed. Five gallons of a spiced beer that I may not like wasn’t tickling my fancy. Now that I had had the beer, it was time to brew it up; at least my version. There isn’t much difference from the BYO article. The main difference is a change in the grain bill, affecting gravity, and not doing a step mash. I also omitted the ginger, not a fan, but I don’t think that is going to be a huge difference with all the spices that are added to the beer. Not a hard brew day but definitely a longer one with the 30 minutes added to both mash and boil times. The temperature also added to my chill time as it took close to 40 minutes to get down to 70*F. I always capture my water that I use for chilling and place it on the various trees around the yard. The River Birch loves those five gallon drinks. Enjoy! Useless Fact: The name Jeep came from the abbreviation used in the army for the “General Purpose” vehicle, G.P.